Hear and Now Entertainment are the UK's largest supplier of British musicians to 4/5* hotels in the Middle East and Asia. 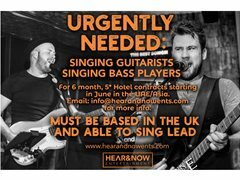 We are looking for talented, hardworking singing electric guitarists with outgoing sociable personalities for 6 month residency contracts at these hotels starting in June. You must be positive, easy going and adventurous, and MUST be able to sing lead vocals while playing your instrument and be able to shred a solo. If you cannot sing or can only sing backing vocals, please do not apply as we do not need normal guitarists and you will just be wasting both of our time. All of these contracts are in either Dubai, Abu Dhabi, Doha, Bahrain or China. Salaries range from $2000 - $2550 PCM plus flights, accommodation, visas, meals/drinks and full use of the hotel's facilities during your stay. They are all 6 month contracts, so you'd need to be available for that length of contract starting from June. To be eligible you must be based in the UK, available for 6 month contracts and have some kind of video of yourself playing and singing on your profile.